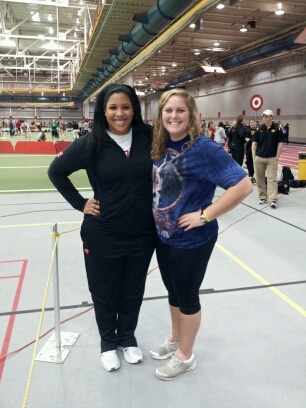 Madison Throws Club alumni Angela Boushea and Molly Griep competed at the Bill Bergan Invitational at Iowa State Saturday January 26. Angela who is in her sophomore year of competition for the University of Wisconsin is currently ranked 8th in the BIG TEN weight throw. Molly Griep is a freshman at the University of North Dakota. Molly is top ranked frosh in the Big Sky Conference in the weight throw and the 2nd ranked frosh in the shot put. Good luck girls and to all of the MTC Alumni competing this indoor season. Thanks for sending the picture Angela. The Wisconsin USATF Junior Indoor Track and Field meet will be held Sunday February 10th, 2013 at Carthage College in Kenosha, WI. Youth Meet starts at 11am. This is a great way to throw some Shot Put and see where you are at before the season begins. Carthage has a beautiful indoor facility, check it out. Once you become a USATF member you are set for summer meets as well. 1. You must become a USATF member to compete in the meet. Its easy just sign up online HERE. It's only $20.00 a year. When you sign up you will want to enter Madison Throws Club as your club. The MTC club number is 20-0350. 2. Sign up for the Indoor Meet HERE. Cost: $6/event. Register by January 31 to avoid late fee. Medals to the top 3 in each Age Division. T-shirts available for sale. Masters - Ma (ages 31 and up in 5-year divisions).